Five years ago Ukraine became embroiled in a war that was sometimes a war within itself against separatists, and sometimes against its menacing and powerful neighbor, Russia. 7: Ballistics vest with 2 LVL 4 Ceramic Ballistics plates capable of stopping upto .30-06 armor piercing bullets. 22: Quick Clot, clotting sponges, suction bandage, and other medical equipment for gunshot wounds and shrapnel wounds. 23: Bandages and ointments: hydrogen peroxide, iodine, dramamine, eyedrops, alcohol, burn ointment, etc. As i said earlier this isn’t everything, but this is the core of what I take with me. Being on the frontlines has so far been the most exhausting experience of my life. You sleep little, you are filthy, and you are wet and cold. I also take with me extra socks, if staying overnight at a different position i take my sleeping bag and extra underwear and a sweater. Here are some images from the front. Second post of the In My Bag project I am doing. This week I am showcasing the gear I take with me while photographing around the Qalandia Checkpoint in the West Bank. The checkpoint connects the West Bank and Jerusalem and is on the outskirts of Ramallah. Anyone crossing from the WB to Israel must show their passport and have the correct credentials to gain access. This makes the checkpoint extremely busy and on a bad day the checkpoint can become impassable with traffic jams lasting up to 4 or more hours. I have photographed at the location multiple times since being in country and always choose the gear I take carefully. Since the checkpoint is busy and there is little shade packing lightly is essential, no one wants to carry a 3 plus pound camera and lens around with them all day, and the small tight quarters of the area make the need for something compact and sleek very real. I thoroughly enjoy the freedom of movement and weight that using mirrorless systems allows me, and these cameras are incredibly light and powerful. Not included are water, gum, and whatever else is in my pocket like change etc. Below are some images made at Qalandia Checkpoint with this set up. Hope these posts are informative and interesting. Stay tuned for the next post sometime next week. I have always been interested in seeing what photographers carry in their bag while on different assignments, thus I have decided to start doing my own weekly posts documenting what gear I take with me on specific assignments. The posts will show the gear I used, a list of the equipment, and some sample images that I took on that particular day/job. This is the equipment I take with me while covering clashes between Palestinian protesters and Israeli troops in the West Bank. This is my typical loadout when covering high intensity situations abroad. The helmet, 24mm lens, and newswear vest are my girlfriend's equipment, however when she is not using them or covering clashes I use them. My own personal head protection is actually a construction helmet. Here are some images from covering clashes that I have made using this equipment. Hope this post is informative and enjoyable, stay tuned for another gear post next week. Skeletal half finished and still in progress buildings tower over the suburban areas of Ramallah. 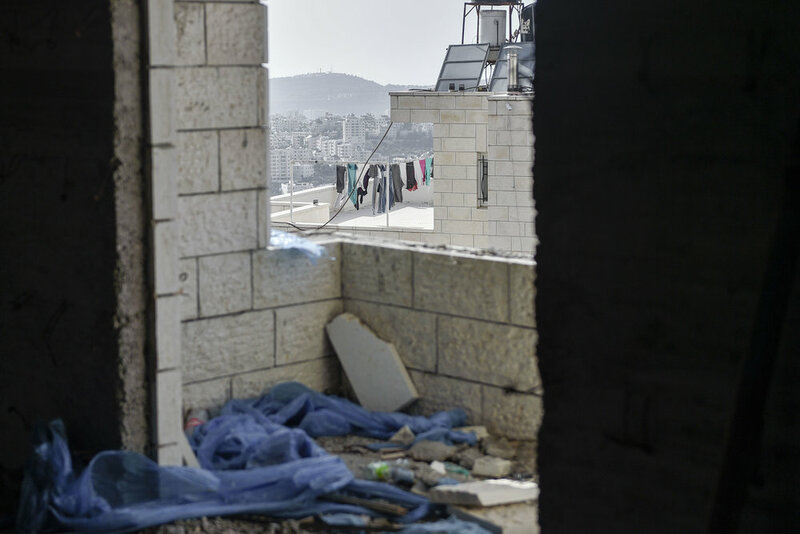 Like gravestones of unfinished dreams, of halted progress, these monolithic spectres watch the daily routines of Palestinians as they go about their day. Some of the buildings are half finished, with the top or bottom floors well lived in by families, while the rest of the buildign remains in a continual state of development. The corridors, empty of life aside from dust covered tools and rickety scaffolding, howl loudly with the summer breeze as if crying out for attention. Much like the land in which they reside they are destined to remain half finished, remainders of a broken promise somewhere in their past. Walking inside of them is much like walking in a cemetery. The air is cool and the stone doorways thick with wanting and a reminder of the possibilities and inevitabilities of life. Being inside and looking out gives a strange sense of shelter and comfort. Where the silence is heavy like the stone slabs used for the stairs and the shadows are deep and dark like twilight in the valley. During rainfall passerbys and stray animals take refuge from the driving rain in the bellies of the towering beasts, and during the heat of the day their shade provides comfort for an afternoon smoke and a nap. In a sense they are still fulfilling the general purpose of a building, but it is impossible to ignore the deeper wanting to complete a destiny that these structures harbor. They were built for man to start life in, to live in, to be more than shelter, to be a home. As time drags on many of these half built structures will remain forgotten. The money to complete them dries up, the permits to continue construction are not issued, or simply they are abandoned doomed to an existence as a reminder of man's flaw of not being able to follow through. Like the lonely sentinels they are though, they will continue to keep watch, as life continues on the streets below. Ramadan is only a day and a half away, soon the call to prayer from the mosques across the Muslim world will announce its beginning in the wee hours of the morning long before the sun peaks over the horizon. Today is a different day of observance though, today in the West Bank and Gaza is Nakba Day which translates to 'Day of the Catastrophe'. Nakba commemorates the day that Israel declared its independence and displaced over 700,000 Palestinians. The tension in the West Bank is thick and weighs down heavy on the shoulders and neck. Before the sun reaches its high point protesters are already preparing for the clashes that will be held throughout the Palestinian Territories. By noon giant columns of black smoke from the roadblocks are towing into the sky and on the outskirts of Ramallah, near the Beit El settlement, Israeli soldiers are lining up on the hill and taking potshots at the protesters on the road below. As the clashes break out, chaos ensues, as teargas, rubber bullets, live ammunition, and sound grenades rain down on the protesters who are armed with slings and rocks. The Israelis advance down from the settlement and continue firing upon protesters who take cover behind their makeshift roadblocks and continue to chant and shout. Nakba day clashes take up most of the day. The temperture soars and so does the fever of the clashes before tapering off, only to start up with a fervor a short time later. The following images are from Nakba in Ramallah near the Israeli Settlement of Beit El. Late at night the city seems alive from afar. In the winter, when the clouds are out and snow is falling, the warm yellow glow of downtown can be seen from miles away, a beacon of life and kinetic energy shining through the darkness of the surrounding farmlands at night. Despite the lights though, once the night firmly grips downtown the signs of life disappear. Empty streets stretch far into distant darkness, where the eyes can no longer make out the shapes of the parked cars that sit silent at street meters. The alleys and walkways of the city are lonely and empty, though the remnants of life remain, strewn about in odd places. 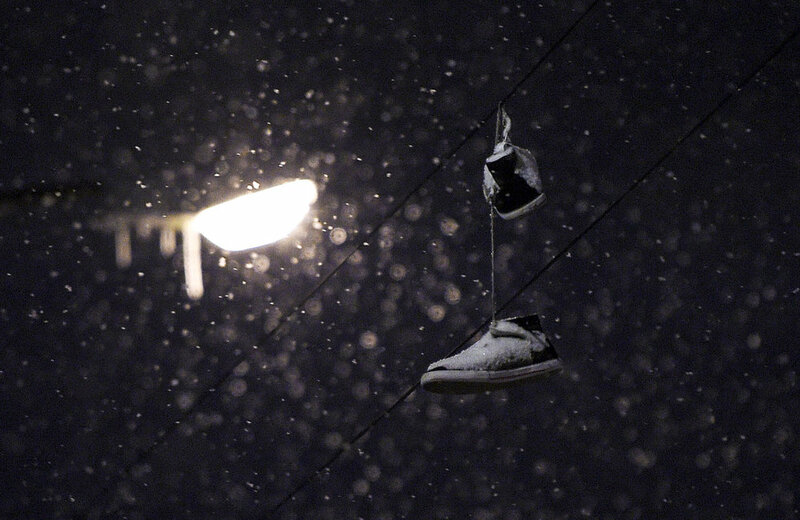 Crushed headphones gather snow on the sidewalk, while discarded footwear sways gently in the cool breeze on a powerline. 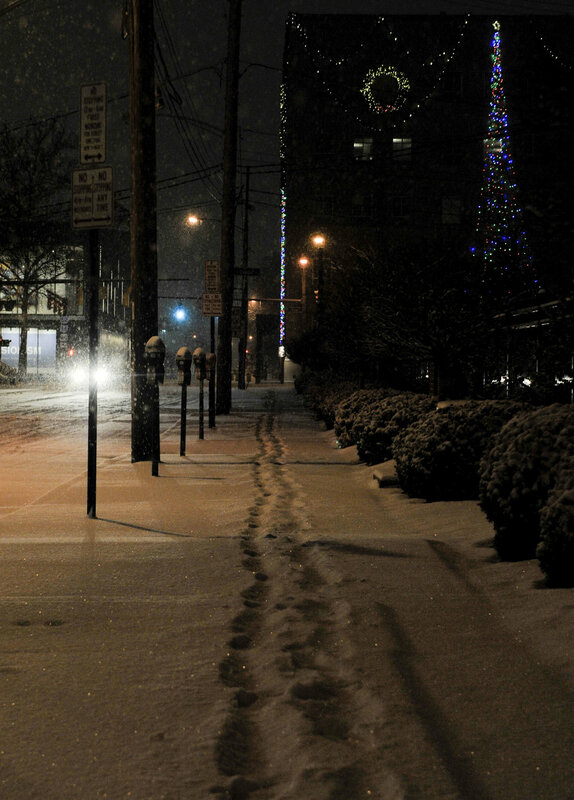 Tracks in the fresh falling snow reveal the evidence of other night dwellers, making their way through the empty city, dwelling in the shadows. Security cameras keep watch over the empty streets and sidewalks. Only capturing footage of the falling snow and the occasional silhouette passing by. The security officer in charge of watching the monitor sits in a heated room and sips warm coffee, that is if there is anyone watching the monitors at all. The sounds of the interstate are muffled by the blanket of fresh snow. Somewhere nearby a train passes through, the horn is quieted as well and sounds as though it is far far away, somewhere outside the warm glow of the city, deep in the shadows where the light wont fall. Occasionally the small silhouette of a fellow night owl breaks the stillness and crosses the empty streets en route to their own destination. They soon melt into the shadows and again the stillness of the city is my own. Hours from now after I have fallen under the spell of slumber, and the sun has begun to rise and spread its golden fingers over the land from the horizon in the east, the city will begin to wake up. The roads and sidewalks will once again be pulsing with life as people go about their daily routines. I am thankful though for these late hours when it feels like it is just me and the city sharing quiet moments. Part of larger project documenting pollution in the part of the Scioto River that runs through Columbus, these images were mostly shot in the Winter of 2017. The focus of the project is to highlight the amount of pollution bodies of water in the United States face, using the Scioto River as an example. The downtown area of Columbus as seen through the remains of an old Television that was propped up on a rock on the eastern shore of the Scioto River. From high above, at a bird's eye view, the Scioto River looks like a long jagged scar cutting through downtown Columbus. When Lucas Sullivant arrived in what would become Columbus, Ohio in 1797 he erected the first settlement in the area on the Scioto's western bank. Before him the Hopewell tribe built their mounds and villages along its' banks. Throughout the year kayakers and paddle boarders enjoy themselves on the normally calm waters that drift under the Broad Street Bridge and provide a scenic view of the downtown area. After summer rains and winter ice melts however the usually tranquil waters can turn fierce. Sullivant himself witnessed the river's fury as his settlement was wiped out in the late 18th century, and again in the spring of 1913 the neighborhood of Franklinton was nearly wiped out as the Scioto rose and flooded the west side of the city. The river is now the main source of drinking water for Columbus, Ohio. A new threat looms beneath the chilly waters of the river. Agricultural pollution in the form of fertilizers and pesticides, storm water runoff from the new construction all along the river front, and the trash from generations of Columbus residents finds its way into the rive, threatening its ecosystem as well as the quality of the water itself. High above in one of the new sky rise apartments the river looks clean and well. Geese float gently along the river, and the new Scioto Mile bustles with activity and radiates beauty; but down on the shores a different story is told. Discarded television sets, a galaxy of litter built over a century, and sewer runoff poison the waters. Invasive species of fish, mollusks, and plant life are creeping in and slowly but surely erasing native species. There is no doubt that the Scioto River of Lucas Sullivant's time is completely different from the Scioto River Columbusites know now. This being known one has to ask, what will the Scioto River look like farther into the future if we don't curb the problems facing it now? The Scioto River isn't unique in these problems. Worldwide bodies of water such as this big and small face the same threats. Whether a stream or a river, an ocean or a pond, the impacts of humans upon their water sources is long lasting and far reaching. These bodies of water will be here long after we are gone, their future however lies in the present. A White Heron finds a snack in the quiet waters of Scioto Audobon Metro Park. Workers start a days labor on the Scioto Mile in Downtown Columbus. The shores of the Scioto Mile, a project completed in 2015 by the city, feature native plants and a restored Scioto River with the removal of the dams that used to interrupt the flow over water through the downtown area. While the efforts to restore the river make some headway, there a many underlying issues facing the river that replanted native plants and dam removal won't fix. The tracks of a bird in wet mud pass a discarded water bottle on the east shore of the Scioto River. A mound of trash lay on the east shore of the Scioto River only 50 yards from the newly built Scioto Mile. Looking down onto the bank of the Scioto River from a bike trail along the Scioto River near where its' largest tributary, the Olentangy River, intercedes it. Ice creeps onto the surface of the waters where the Olentangy bleeds into the Scioto River a few miles upstream from Downtown Columbus. Low water levels near the intersection of the Scioto River and Olentangy River reveal dirty secrets hidden beneath the soil at the bottom of the Scioto. 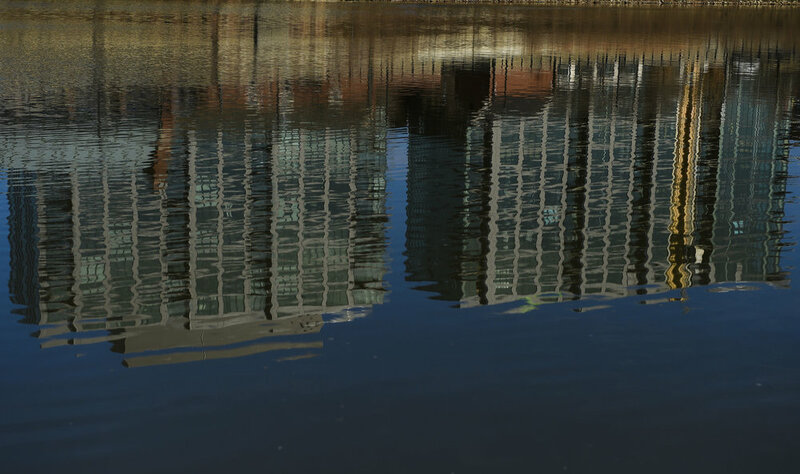 Newly built high rise apartments are reflected in the waters of the Scioto near Confluence Park in Downtown Columbus, Ohio. Sky scrapers loom in the distance as morning light illuminates an empty whiskey bottle on the west shore of the Scioto River. The corpse of gull lay next to a discarded tire on the east bank of the Scioto River 20 yards from a sewage runoff that drains into the Scioto River near newly built high rise apartments. Artificial flowers float in storm water runoff on the east shore of the Scioto River. The orange grime gathering over the soil is Iron Oxidizing bacteria. The pollution in the Scioto is not unique, nor limited to the rivers and lakes of Ohio. Throughout the world waterways are polluted and concern for the ecosystems and the effect that this pollution has on others is disregarded. What we cast off into these rivers and streams may not affect us in the present, but like every other problem it only gets worse the longer it is neglected. Beneath these waters a rich record of human history is buried, if we don't take action to care more for the resources available to us now, we may not have much more of a future share. On September 9th I and my two colleagues Seth Herald and Megan Jelinger traveled down to Florida to document Hurricane Irma and the people who were affected by it. We drove through the same storm that had wiped out the Caribbean and wreaked havoc on parts of Florida. The following are my images and writings on covering Hurricane Irma and spending time with the people who came home to find their lives changed by its wrath. The day is growing late and the shadows growing longer as Juan Zumaya maneavuers his small boat through the deep black waters that now cover what used to be Bonita Commons, a neighborhood in the city of Bonita Springs, Florida. The puncturing smell of raw sewage, gasoline, and rot hang over the entire area. The wrath of Hurricane Irma might not have been what most Floridians had expected, but for those living in Bonita Commons, the storm came with merciless ferocity. "We've had floods before, but never like this." Juan comments. 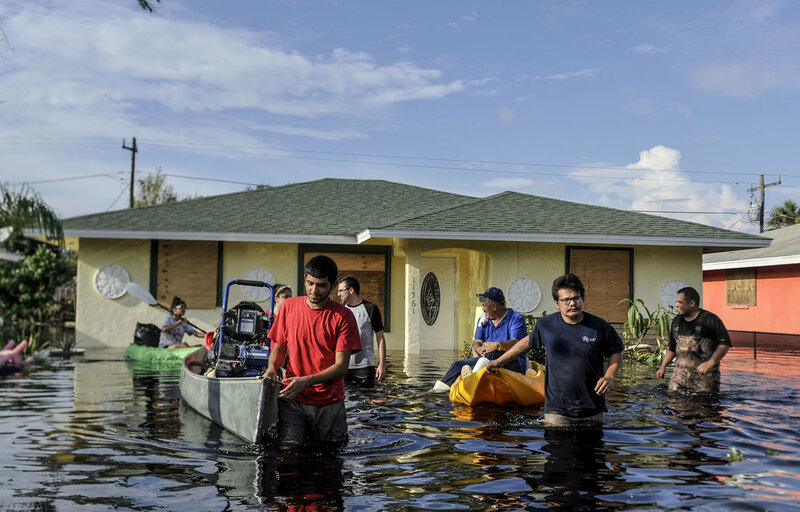 The flood waters had risen in the week before, after fallout from Hurricane Harvey drifted through the area, they had yet to recede when Irma arrived. Personal belongings float in the yards of half submerged houses, occasionally other boats can be heard, heading out to either rescue those who stayed or to retrieve personal belongings from homes. As the sun sets over the horizon the mosquitos come out in full force and most of those who stand on the high ground of the main road pack up what they gathered and leave to wherever it is they are staying for the time being. It is early afternoon, and the heat of the day is upon Bonita Springs. Looking out into the flooded neighborhood is blinding as the noon sun reflects of the surface of the fetid water. One man who is putting gas into his boat makes a joke about alligators swimming around at night on his street. It is true though, the day before an alligator had been spotted near the back of the neighborhood near the overpass. Jose Gonzales Jr. and Jesus R Angel are wading through the tea colored waters with two boats in tow. They are helping Jose's parents gather the remaining personal belongings from their flooded home on Pawley Avenue. The Gonzales family had evacuated North to Alabama as Hurricane Irma made its way up the Florida Peninsula. When they received the all clear, they returned to find their home flooded. In their haste to evacuate they didn't have time to pack up all their personal belongings, and upon returning had stood for a while on the main road by their neighborhood in disbelief. Jesse Martinez, son in law to Jose and Olivia Gonzales, lives not even a mile up the road from Bonita Commons and armed with a pair of old waders and several kayaks, joined the family as they transferred their belongings from their home to his. Going through the belongings that were ruined in the flood brought Jose and Olivia's daughter Selena Gonzales to tears. Pictures, diplomas, and family heirlooms ruined beyond recovery overnight. Jose and Olivia are pulled on boats to the dry land on the main road. The family jokes with each other as they leave. Despite the severity of the situation, Jose Jr. says his parents are just glad everyone is ok and for that they are happy. Luis Arango was one of the lucky few whose home remained safe from the floodwaters. Resting on a small hill just a few feet higher than the other homes, the water crept up to within several feet to his garage then stopped. "I had installed some cameras before we evacuated to Lake City, and I was watching the water rise higher and higher, and I kept thinking 'This is it'" He comments. With his wife and daughter still in Lake City, Arengo enlisted the help of his friends Carlos Hernandez and Walter Crespo, as well as Crespo's 13 year old son Jonathan in returning to his home. The first steps to take were transporting a generator and gasoline to the home, then taking down the steel sheets that cover the windows and doors of the home. A full days work in nearly 100 degree heat. Walter Crespo spoke of he and his traveling from near Tampa to help Luis. "No other country in the world is like the US, our name even, it isn't like France, or Spain that is just a name, it is the UNITED states, and when we pull together and unite we can help each other overcome anything. That is what I am trying to show my son here." At 2:30 in the afternoon the hot Florida sun is beating down on everyone. Florida natives comment on the heat as they wipe sweat from their brow and avert their eyes, but with a smile add "I mean it is Florida". While the heat of the day is to be expected, what is most supprising among those who've lost so much is the sense of camaraderie and community. Several people came down to Bonita Springs from other parts of Florida with their bass boats and canoes in tow to help clear brush, transport people in and out of the flooded neighborhood, and to bring food and water to those who need it. Adorned in little more than a t-shirt, shorts, and tennis shoes Jay Berbue and several friends from other parts of Florida go about trying to clear the flooded streets of fallen trees and branches. The sound of chainsaws and boat motors has become a background drone as Jay and his partners continue working in the hot sun. "I was about to leave to go up to Canada with my boat and do some fishing, but when we saw this about happen I called up some of my friends and we came out as soon as we could." Jay comments as he wipes sweat from his under his hat. The day is long, but as the sun dips down towards the horizon scores of others like Jay have shown up to hand out food, water, and blankets. While the full power of Hurricane Irma was not felt in Florida as it was in Barbuda and Cuba the devastation in Bonita Springs will remain a scar for quite some time. As the water continues to stand stagnant in Bonita Commons' streets, mosquitos breed and the risk of mosquito born diseases rise in the area. Black mold sets in quickly after floods, and can quickly over take the inside of a home making it completely inhospitable. The residents who continue to filter in will have to deal with these battles in their uncertain future, but for now most are just thankful to have the ones they love safe and by their side. Somewhere up north the weather is already turning to fall. Even though it's only the beginning of September, the faint whispers of changing seasons float on the cool air. The fishing and hunting lodges are starting to close up for the season and the bush planes that swoop down to the tea colored lake surface like big insects are no longer bringing in guests. The winters are long here, and vicious, and preparations for the season must be taken far in advance. The pike are still biting at the line though, just as the swarms of mosquitos that hover around the moss covered tree stumps still buzz annoyingly in your ear. The season for the Aurora Borealis is soon to pick up as winter lies ahead, and soon the empty night sky will be pulsing with their faint pale color. Pretty soon moose season will be starting and shortly after the bears will be seeking their dens to hibernate. Though up here, in this solitude it is unlikely anyone will take a moose. Nakina, a small town surrounded by a vast ocean of forest and lakes, is getting busier too. As the bush planes swoop in and return the hunting guides and staff home, the population of the small town has grown considerably. Everyone returning has a story from this season 'on the lake' the big moose they saw, the biggest pike they caught, the goofy city boy who fell out of the bush plane and into the cold waters of the lake. Some will stick out the winter in Nakina, moose hunting, working on arranging trips for customers for the next season, making repairs to their home, but others will leave Nakina and visit family in Toronto or travel the sportsman circuit in the US. With the changing of the seasons the smell of campfires and stove fires is more welcoming. Like an old friend the smell of woodsmoke drifts across the vast waters of the lake and into the town of Wawa. The big goose that is the town's pride needs to be repaired before this next winter knocks it down again. The students who work at the local trading post and tourist stop are getting ready to go back to school, either at the local high school or farther away to colleges in Toronto or Waterloo. Months from now when the last snow has melted in the shade of the pine trees, the lakes will still be there, full of life and unchanged, sometime from now when I return I know theyll be the same. As the overgrown ghosts of former settlements show, up north is a place where nature won't bend the knee to man's advances. Street photography is a discipline that at first glance seems easy enough, in theory what could be easier than snapping candids of passerbys in the city? The reality though is that street photography is incredibly difficult and challenging. There are many off days, I've spent countless hours wandering through city scapes and suburbs with no results, only with hopes that the next morning or evening will be better. That is, for me, where the real reward for street photography lies. When everything lines up just right, and you snap that shot and know you got gold. I've been doing street photography for about 8 years now, and over the past year have really dedicated myself to the art. Every weekday morning and many evenings I take a 2-3 hour walk around Columbus with whichever cameras and lenses suit me for that day. There are no specific tools, no you don't need a leica and a 50mm lens, no you don't need black and white film, no you don't need a moleskin diary or slacks and dress shoes. The only thing you really do need is patience, and of course a camera. There's been mornings and evenings where I sit in one specific spot for hours and waited out a moment. Sometimes it happens, other times the light changes and the moment never comes. That is the fun in it though, and over the years I have come to learn alot about people, weather, luck, and light while walking around with cameras dangling from my shoulders. Here are the images I am most proud of, the little golden gems I elated over and wanted to rush home right away to edit and post. Red White and Boom on West Broad Street, Downtown Columbus, Ohio. July 4, 2017. East Broad Street, Downtown Columbus, Ohio. May 14, 2016. State Street, Downtown Columbus, Ohio. March 13, 2016. Barber Shop on Gay Street, Downtown Columbus, Ohio. June 8, 2017. Broad Street and North High Street, Downtown Columbus, Ohio. November 28, 2016. North High Street, Downtown Columbus, Ohio. November 5, 2016. Towne Street, Downtown Columbus, Ohio. October 20, 2016. Broad Street, Downtown Columbus, Ohio February 25, 2016. East Broad Street, Downtown Columbus, Ohio. December 20, 2012. East Town Street, Downtown Columbus, Ohio. December 13, 2013. Lisle Alley, Columbus, Ohio. December 15, 2010. Nationwide Boulevard, Downtown Columbus, Ohio. August 8, 2016. East Long Street, Downtown Columbus, Ohio. August 14, 2016. 4th Street, Downtown Columbus, Ohio. February 25, 2016. North High Street, Short North Columbus, Ohio. June 17, 2017. Oak Street, Olde Towne East Columbus, Ohio. June 26, 2016. Upper Cup Coffee Shop, Parsons Avenue, Columbus, Ohio. May 7, 2016. Little Palace, 4th Street, Downtown Columbus, January 24, 2017. Krogers, Front Street, German Village, Columbus, Ohio. May 1, 2016. Self Portrait, Cleveland Avenue, Columbus, Ohio. May 7, 2016. North High Street, Downtown Columbus, Ohio. July 4, 2017. State House, Downtown Columbus, Ohio. June 20, 2017. The first time I really took notice of just how vast and empty the outskirts of Marion are was when I responded to the scene of a homicide. It was a 20 minute drive to the location, a small strip of 4 homes surrounded by prairie and farmland, and when I arrived dark clouds were gathering in the distance. Knee-high grass blanketed the ground and the changing winds of the storm drove rolling waves of cool air across the grass. While I stood watching the grasses sway, the shadows of the clouds began to creep from the horizon and quickly overtook the warm sunspots. It was beautiful, and in that moment the places I had referred to as 'The Middle of Nowhere' became much more. It wasn't nowhere, it was much more special than that dismissive label, it was freedom, a feeling that if you wanted you really could just disappear. There have been many times since that as I've driven along Groundhog Pike, or Linn Hipsher Road, that I've felt the compulsion to just drive and drive, because out there it is possible. Out there it seems anything is possible. The following writing and photographs reflect, I hope coherently, this sense of vastness, how it relates to my own emotions of where I am at in my life, and the nature of the many smaller towns that dot the Ohio and midwest landscapes and the people that inhabit them. Light falls early, and like water from a burst dam, the golden rays of morning quickly flood the landscape. Already the killdeer and Meadowlarks busy themselves zipping over the heads of Deer, still alert and grazing before the sun is too high. A lone car, headlights burning through the thin morning fog, hurries its way down the gravel road into town, pursued close behind by a cloud of dust that is a brilliant orange in the morning sun. The sound of the engine cuts through the sounds of the morning, but quickly it passes, and slowly dissapears into the horizon, the red glow of taillights melting to nothing over a small rise. Thick billowy clouds in the distance hide the still dark sky, though it is rapidly draining to a deep blue, the diamond glow of stars still shine brightly far above the streaking contrails. Out at the municipal airport, a pilot too stares up into the waning night sky as the sun slowly bleeds its rays into it, reading every subtlety. The warm styrofoam cup of fresh coffee warms his hand, and its smell makes his mind wander back to stories his grandfather told him of heroes who flew the skies and navigated by the same stars. A farmer is already working on his machinery, before the sun awoke, he had already started his day and it won't end until after the sun has gone away over the treeline at the end of his field. 'The soil is good here, so we are good here' his grandfather had once said to him on a hot day late in the summer while he worked in the old barn. He remembers still how the dust from the wheat harvests glowed and danced in the sunbeams that had found their way in through the cracks in the walls. He remembers the taste of sawdust and sweat, and how the air hung stagnant in the barn with the thick smell of oil and rotting wood. He remembers how the dirt from helping his father in the tractor stayed under his fingernails for months, and how by the end of the summer his bare feet were hard enough to run on the gravel road. He often wonders if his grandchildren will ever have any memories of him that are as tangible as his. The soil is good, the soil is very good. To even those who are not farmers but still abide by the instinct to create and grow gardens in their backyards, the gift of the soil is tremendous. Glaciers had once pushed onto the land, flattening it like dough, and when they melted deposited this thick rich earth in their wake. Earth that countless hands would toil and work to make a living, hands that would be blackened by it, hands that would bleed into it, hands that would one day become a part of it. It wouldn't only be the crops though that would spring from the rich earth. Cheaply built but expensive homes began dotting the landscape at the end of the last decade. Their windows reflect the rising sun far across the farmland and prairie, they are stirring now too and coming to life. Isolated settlements like islands sepperated by the grasses and blacktop rivers that intersect here and there. Children grow up here, and in time the landmarks they establish and use everyday will dissapear as more settlements are built. The schools have stood solid for the better part of a century. From the air, the baseball diamonds and the track look like alien symbols, such contrast on the landscape. The teachers working at the school remark on the 'bring your tractor to school day' and the prom which was held in the humble gymnasium when they were students at the same school. Nowadays though, fewer students are catching the school bus from the end of a gravel road, even fewer have ridden a tractor. Many are now learning computer programming or earning college credits before they graduate. With all the opportunities available to them now, most of their futures lay in other lands. This many of the older teachers will tell you with pride, but burried beneath, an undertone of sadness. Times are changing, and the world changes faster than many would like. Somethings stay the same though. The history teacher still drinks two cups of coffee in the morning and stands on his porch, looking out over the vast expanse of untouchable prairie. The math teacher still has coffee breath but his co-workers are too polite to tell him. The poster with the graduating class of '72 is slowly decaying, despite the faculty buying a better poster frame for it. The baseball field is still mowed by a man with the last name Barger, who also coaches the baseball team, but it was his father's father before him who first decided to start a baseball team. The baseball team that would win a state title for the first and only time in the school's history. The old roads run parellell to the infinite row of telephone lines and both keep their secrets, but memories good and bad still mark certain sections. A rock with the fading red comment 'I Still Love You' watches over a bend in the road before it comes to an intersection. Small crosses with flowers and balloons that dance gently in the wind remind motorists of old and personal tragedies. Some old and forgotten, and some still new and fresh with their sorrow. In time, the efforts and structures that were built by man decay and become only another part of the landscape. The old house that may be haunted is slowly consumed by Ivy, its windows long ago broken out with rocks, its floor caving in. The one room schoolhouse that one time served as the townhall and church, is now merely a marker and a chimney. In the heat of the summer, when the locusts chir and the doves coo, when there is not enough shade to be found, and the beads of sweat gather and run from your hairline and burn your eyes, the youth find solace in the cool waters of the quarry. At one time the lake functioned as a staple of the nearby city, where livings were earned and production was key. Now teenagers plunge with a deep faith from the cliffs and into the icy water. Water so clear that on a clear day steam shovels and heavy equipment can be seen resting like shipwrecks on the bottom. They say several teens drowned here, most recently the quarry was closed after a drowning. The calm clear water gives way to a deep blue darkness far far down, like the secrets of the town, the calm inviting waters are not always as they seem. Sometimes the most inviting things in life hide a deep treachery far below the still surface, where the darkness overtakes the light. As the harvest rolls around, the farmland comes to life in a special way. The rich smell of cut wheat, soy beans, and dirt hang thick in still air and overcome the senses on a windy day. Combines and tractors kick up clouds of dirt that seem to hang in the air forever. Bails of the harvested crops dot the land in the same way herds of gazelle do in the Sahara. Hard work is important, the times keep moving and there are those who accept and understand the only way to keep up is to speed up. It is a law that is understood by many, yet not all abide by them. Sweet tea home brewed in the sun sits on the unpainted back porch, condensation running down it. The brilliant gold color of the straw when it is time for the harvest is pleasant and relaxing. An old radio plays the best country music from the 70's Why rush? Time has a way of catching up with everything, and its not always guaranteed that the work put in yields desired results. The laziness of the summer day is made to enjoy, the landscape and smells are to remind us to slow down a little, enjoy what's around, and appreciate that the glory of everything is fleeting. Flies buzz and the smell of decaying vegitation and dead fish hang thick in the air over the wetlands where a Green Heron waits patiently in the shallow water. The rich green of the algea hides the minnows and tadpoles beneath the still water. Spring peepers and bullfrogs chorus in with the locusts and crickets. With the final days of summer coming to a close and the familiar smells and sounds of fall growing to an invitable crescendo, the heron will soon be leaving the prairie for warmer lands. For now though, he is patient and content with the small ponds he's called home for the summer, and he will return once the snows thaw. While the summers are lazy and hot, the winters in the vastness are cruel and aggressive. The cold winds rip mercilessly across the landscape, and in a fresh snow throw up blinding curtains of white over the roads. But in the cab of a snowplow there is warmth. The radio plays the most current rock hits and drowns out the grind of the plow as sheets of white powder erupt into the crisp cool air. It's a tedious job, and in the prairie, surrounded by the emptiness of an endless white horizon, the urge to doze is almost irresistible. The smell of coffee fills the cab and along with the heater, keeps the driver warm. A sasquatch air freshener hangs from the rearview mirror, bought in Cleveland last summer when she and her younger sister made the trip up to watch a Cavaliers game. A stack of books on Robotics and linear algebra threaten to topple off the passenger's seat as she maneuvers the snow plow around a curve in the otherwise straight and narrow road. She has to hold the tower of literature steady the same way she does when her daughter is riding with her and the driver in front of them breaks to fast. As soon as her shift ends, she'll be making her way on the same roads she plowed to the career center for afternoon classes on Fanuc Robots. Honda is hiring robotics programers, one of her teachers had told her, and once she earns her OSHA certificate she will be more than qualified for the job, and that will bring a nice change, but on mornings like this she doesn't mind the warmth and comfort of the cab. The snow stays on the ground for weeks sometimes, with tempertures warming then cooling, melting then freezing. Through the windows of a farmhouse, caked with a thin layer of ice on the edges, the white sky touches the endless white ocean of old snow. A woman puts on her thick soled boots as she prepares to go and check the mail box at the end of the drive. Not much mail comes anymore, the occasional card from her children updating her on the weather down in Florida, the messily scrawled notes from grand children, and of course pointless letters in envelopes marked 'URGENT' from scammers hoping to swindle 'old timers' out of their money. The walk down the gravel drive is cold and windy, a semi truck roars by on the road bringing with it a cloud of loose snow in its wake. The american flag her late husband had wired to the mailbox post shudders violently with each gust of winter air. It is tattered now and she knows eventually it will have to come down, or be torn from the thin dawl rod holding it. It holds memories though, they had met at the Steel Plant, where they would both spend almost half a century working as husband and wife. When they were married the company had sent them a piece of rebar with their names ornately etched into the side like a piece of modern art, it still sits on the fireplace mantle next to his ashes. Spring, like winter, comes on slowly. The heavy grey clouds that threaten snow storms gradually give way to darker sagging rain clouds. Spring showers pound the land and the small streams that had slowed to a mere trickle suddenly swell and surge with violence. Warming temperatures melt the last of the now grey and black walls of snow on the sides of the roads and the endless prairie transitions from the cold and barren landscape to bright explosions of green brought on by spring rains. The smell of blooming flowers and prairie grasses growing is faint but distinct in the changing air. Spring fades slowly into summer. The graduating seniors are turning their tassles and stepping into the next grand adventure of life and the crops already planted. The days are becoming hot and the shade is scarce under the noon sun. Clouds stretch out as far as the eye can see, painted on the rich blue canvas of the sky. A car travels swiftly down a strange road, the driver admiring the freedom of the endlessness. He is no stranger now to the land, on days that allow it he often finds himself returning to the same spots, and sometimes when he's lucky, finding new areas that promise hidden treasures. The land whispers in low tones, awakening in him a sense of adventure and possibility that is so easily lost and forgotten anywhere else. The car slows to a stop and the purr of the engine dies down. Now, only the sounds of the wind and the birds can be heard. Through a viewfinder time can be stopped and moments preserved. Eventually his time of exploring will come to an end, with only his photographs and writings lingering, and long after he is gone and the photographs and writings lost to time, the cycle of the Vastness will continue on forever, unbroken and unyielding. With winter bleeding away without much of a fight, spring and all the new bright and lively smells and colors that accompany are quickly taking over the Ohio landscape. Marion and Columbus, my two main stomping grounds, are coming to life in the same way that the forests and fields are as well. For this I am glad, the longer days, and the gentle temperatures that feel just right, of course it wont be long until we'll all be complaining about humidity and heat. The following photographs are selected images taken from the months of February to April, both personal work and photos from my job at the Marion Star. There is no particular theme this time around, just a handful of photos I've made that I enjoy and hope you do as well.